For the next three weeks San Francisco Bay will be the centre of the Finn world. On 27 August the Finn Gold Cup will start but this Friday, 20 August, the Finn Silver Cup for the Jorg Bruder Cup - the Junior World Championship - will get underway. For many years the Junior Worlds was held as part of the Finn Gold Cup but increasing numbers of Juniors in Europe forced the event to be held independently and for the last few years has attracted in excess of 50 boats. This year it will be sailed out of St Francis Yacht Club, USA with sailors from 10 countries competing for the Jorg Bruder Cup, which was first presented in 2004 by the Brazilian Olympic Committee in memory of the popular, three time Gold Cup winner. The defending champion is in fact also Brazilian. 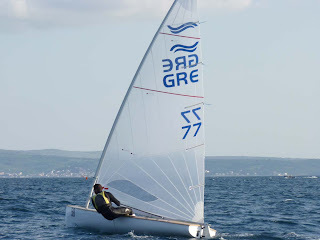 Jorge Zarif (BRA) won a close fought series last year on Lake Balaton in Hungary, and though he hasn't had as much international experience this year as some of his main rivals, is expected to be a firm favourite. Perhaps the main favourite is the twice crowned Junior European Champion Ioannis Mitakis (GRE), who not only retained his Junior European title in Split this year but also presented himself very well in the senior fleet, finishing 12th overall. Racing commences on Friday 20 August with nine races scheduled. The medal race for top ten is scheduled for Tuesday 24 August and all races for the Silver Cup are being held from St Francis Yacht Club, before the fleet moves across the bay to Richmond for the Gold Cup, so the boats are closer to the Berkeley Circle, where the world championship racing will be held.